Rio Grande’s Clayton Surrell slides home with a run in the RedStorm’s game one win over Brescia, Saturday afternoon, at Bob Evans Field. Rio swept the twinbill from the Bearcats by scores of 6-4 and 8-3. 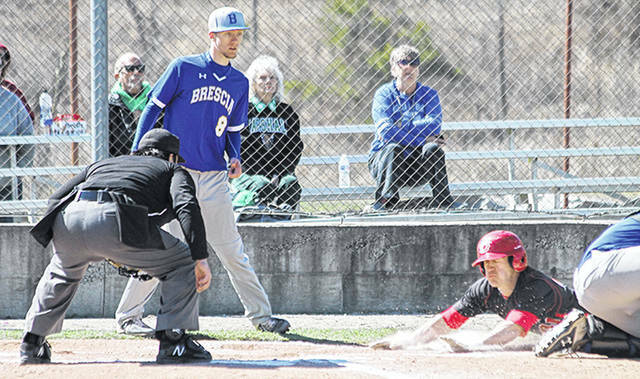 RIO GRANDE, Ohio — The University of Rio Grande ran its winning streak to eight straight games with a doubleheader sweep of Brescia University, Saturday afternoon, in River States Conference baseball action at Bob Evans Field. The RedStorm held on late to post a 6-4 win in the opener, while cruising to an 8-3 triumph over the Bearcats in the nightcap. Rio Grande improved to 24-10 overall and 9-3 in the RSC as a result of the sweep, remaining 1-1/2 games behind Indiana University Kokomo for the league lead. Brescia slipped to 8-15 overall and 3-7 in conference play. Rio Grande jumped to a 2-0 lead in the opener just three batters into the first inning thanks to a leadoff double by junior Dylan Shockley (Minford, OH), an RBI single by freshman Clayton Surrell (Carroll, OH) and a run-scoring double off the bat of senior David Rodriguez (Santo Domingo, D.R. ), but the Bearcats rallied to tie the game thanks to a solo home run by Colton Hurt in the second inning and a two-out RBI single by Yonnelle Firebrace in the seventh. The RedStorm roared to life with four runs in the home half of the seventh thanks to a two-run double by Surrell and a two-run single by Rodriguez, but a ninth inning comeback effort by the visitors made things interesting. Sophomore reliever Caleb Fetzer (Van Wert, OH) retired the first two batters routinely, but a walk, an error and an infield single by Firebrace made it 6-3. Shockley was brought on after Fetzer ran the count t0 3-0 on pinch-hitter Zach Schied and missed on a 3-2 pitch for a walk which loaded the bases. Zach Johnson followed with what appeared to be a game-ending fielder’s choice grounder to shortstop, but senior Michael Rodriguez (Santo Domingo, D.R.) was forced to hang on to the ball after second base was left uncovered and Alejandro Hernandez scored to make it 6-4. The drama finally came to an end moments later when Shockley induced Alex Pennes into a game-ending grounder to shortstop. Surrell and David Rodriguez both went 3-for-4 with a double and three RBI, while junior starter Zach Kendall (Troy, OH) picked up his fourth win after allowing six hits and one earned run over eight innings with a career-high 10 strikeouts. Shockley’s save was his third of the season. Manning Webb started and took the loss for Brescia, allowing nine hits and six runs over six innings. Firebrace finished 2-for-4 with two RBI for the Bearcats. Game two saw Brescia push across an unearned first inning run before Rio Grande scored a trio of unearned markers in the home half of the inning to take a lead it would never relinquish. The RedStorm then put things on ice by scoring five times in the fifth inning. Surrell led the offensive charge again for Rio, going 2-for-3 with a double and two RBI. Michael Rodriguez also had two hits and drove in a run, while Shockley finished with two RBI. Senior starter Pierce Knisley (Chillicothe, OH) improved to 3-4 on the season, allowing two hits and three unearned runs over 5-1/3 innings. Tyler Milby started and suffered the loss for the Bearcats, allowing five hits and seven runs over 4-1/3 innings. He also issued five walks. Johnson and Chase McClaren drove in one run each for Brescia. Rio Grande returns to action next Friday when it hosts Midway University in the opening game of a three-game weekend series. First pitch is set for 2 p.m.